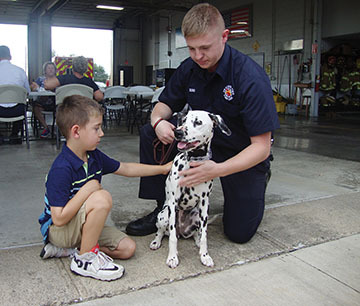 Emerson Wonderly, 7, of Galloway pets Prairie Township Firefighter Brendan Bobo’s dalmatian Halligan. Wonderly attended the annual Prairie Township Fire Department Food Truck and Fire Prevention Festival on Oct. 7. Attendees could learn about fire prevention, while also enjoy food from local vendors. 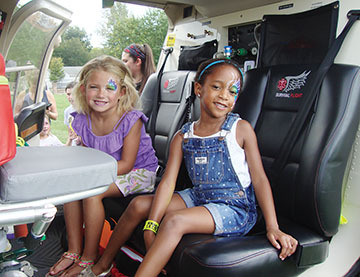 Hailey Shanks (left), 5, of Galloway and Reighlyn Austin, 5, of Galloway check out an emergency helicopter at the Prairie Township Fire Department Food Truck and Fire Prevention Festival. At the event, attendees also could escape a smoke house, learn fire safety tips and explore other first responder equipment.